A Graveyard Preservation Primer has proven itself to be a time-tested resource for those who are seeking information regarding the protection and preservation of historic graveyards. It was first written to help stewards of early burial grounds responsibly and effectively preserve their graveyards. Much information found in the first edition of the book remains valid today. Still, much has changed in the twenty-five years since its first publication, and the new edition reflects these changes. Attitudes and the understanding of historic graveyards as an important cultural resource have grown and developed over the years. Likewise, changes in treatments have also taken place. Perhaps the most dramatic change in burial ground preservation is in the world of technology. Changes in computers and the way we use them have also changed preservation practices in historic graveyards. Discussion of technological changes in the new edition includes those in mapping, surveying, photography, archaeology, and other areas of evaluation and planning. Consideration is given, too, to maintenance and conservation treatments, including both traditional and newer treatments for stone, concrete, and metals. Metals were not discussed in the earlier editions, and protection and preservation of the landscape as it relates to graveyards is an expanded focus of this book. The historic preservation of cemeteries and burial grounds is an aspect within the discipline of historic preservation that is unknown to many. Those whose responsibility is the care of these historic sites may be unfamiliar with appropriate approaches to such areas as documentation, planning, maintenance, and conservation. Unwitting personnel can do irreparable harm to these important cultural resources. The Primer is an effort to protect historic cultural resources by breaching the gap between maintenance staff, cemetery boards, friends’ groups, and graveyard preservation professionals by offering readily available, responsible information regarding graveyard protection and preservation. It is also designed to assist those who would undertake a preservation project in the reclaiming of a neglected or abandoned historic cemetery. The book is generously illustrated with diagrams and photos illustrating procedures and gravemarker and graveyard forms, styles, and materials. The appendix section is completely updated and expanded, offering a worthwhile resource in itself. Trained through the National Trust for Historic Preservation’s Restoration Workshop, Lynette Strangstad has specialized in graveyard preservation since 1980. She has served as conservator, burial ground consultant, preservation planner, and speaker at sites throughout the United States and is nationally known for her work in burial ground preservation. Educators and enthusiasts interested in graveyards and graveyard preservation will appreciate this surprisingly comprehensive text. Strangstad makes a convincing case in her opening chapter on the historical, sociological, and artistic value in preserving these early cemeteries. Subsequent chapters offer extensive information and resources for preservation efforts, including organizational, ethical, and conversation issues. An excellent tool for those working to restore and/or preserve cemeteries whether a small family project or a larger more involved project. This book should be considered a necessary reference guide for anyone contemplating a cemetery restoration project since many problems are addressed. 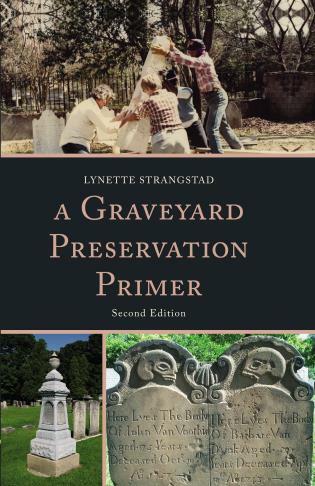 Anyone interested in the restoration and preservation of historic burial grounds will enthusiastically welcome this greatly expanded and updated edition of Lynette Stangstad's classic Primer – an indispensable resource in harmony with 21st Century technology and scholarship. Lynette Strangstad's A Graveyard Preservation Primer set the standard for the field of cemetery studies twenty-five years ago. Her information about conservation techniques was essential for those of us who sought guidance in this new discipline. The second edition of the Primer provides material regarding preservation technologies that have been recently introduced, and also addresses the myriad new methods for documentation of historic burial sites. The development of GPS, computer programs and digital photography have advanced the accuracy and efficiency of survey and recordation -- and as usual, Strangstad leads the way in telling us how to do it.